A luxury multifamily apartment complex in the heart of Hollywood, CA, 1840 N. Highland Ave., is steps away from the world-famous Hollywood Bowl and Hollywood Boulevard. The 118-unit complex sits on an 8,144-sq.-ft.lot, and presented several challenges. 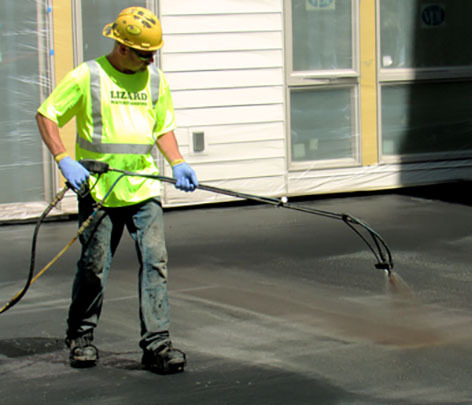 WICHITA, KS… EPRO Services, Inc. (EPRO), an innovator of composite waterproofing, methane mitigation, and vapor intrusion systems, introduces HotDeck™, a hot fluid-applied asphaltic membrane waterproofing system. EPRO Services, Inc. (EPRO), an innovator of composite waterproofing, contaminant barrier systems, announces two key additions to their growing team, enabling the company to better serve its customers nationwide. 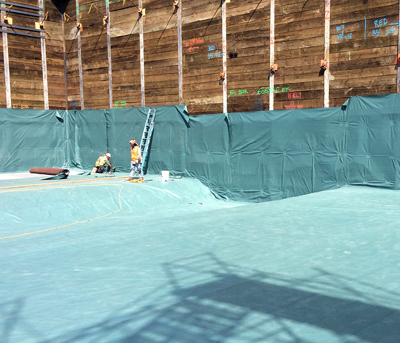 Blindside waterproofing systems are among the most difficult to design and install. 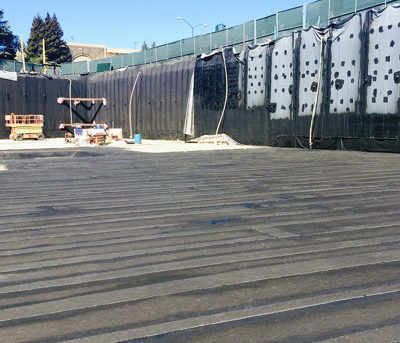 These waterproofing and drainage systems are placed before the structural walls are poured, which means they must be installed over a soil retention system rather than concrete or masonry. 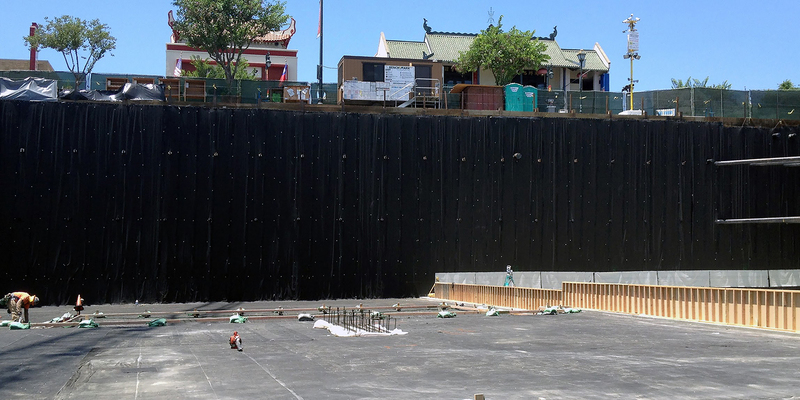 That retention system—whether it be lagging beams, sheet pilings, shotcrete, or compacted native soils—is typically rough, uneven, and subsequently requires extensive detailing. EPRO Services, Inc. (EPRO), an innovator of composite waterproofing, methane mitigation, and vapor intrusion systems, announces three key additions to their growing representative base, enabling the company to better serve its customers nationwide. The first step in determining the proper air/vapor barrier is establishing the planned use of the building and considering the climate zone. Knowing the temperatures and general climate conditions the building will be exposed to is key in deciding what products to use. It is also imperative to regard the barrier as part of the entire wall assembly; the barrier material and all system components and accessories should be tested. The air/vapor barrier must also be continuous around the entire structure – including window wells and corners, roof joints, and flat areas of the building. Today, more clients seek out a permeable air and vapor barrier to be made from recycled products, in keeping with current concerns regarding sustainability. Zero lot line (ZLL) below-grade construction allows building teams to maximize square footage by building directly up – or extremely close – to the property line. This method is often used in urban environments where space is at a premium. Many waterproofing consultants make the decision to use waterproofing systems comprised of redundant layers of materials to resist soil and water ingress or to block potential contaminants, thereby increasing the chances of success for the life of the zero lot line building envelope. Redundant systems can be tailored to specific site needs, which can potentially change as the construction process unfolds. One of the most complex components of building design is the waterproofing system - especially the below-grade protective applications in that system. These are often required to be multipurpose and must be strategically applied to the foundation in order to mitigate conditions. WICHITA, KS… EPRO Services, Inc. (EPRO), an innovator of composite waterproofing, methane mitigation, and vapor intrusion systems, provided blindside waterproofing and building envelope protection for 1840 N. Highland Ave.
EPRO Services, introduces E.Series tiered line of composite systems to meet any performance need or project condition.